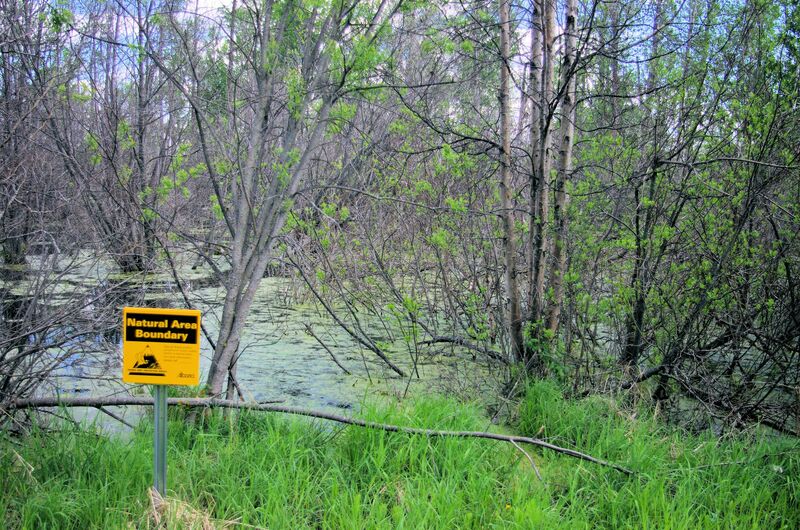 By providing this information, the Red Deer River Naturalists assumes no liability whatsoever for your safety or well being on the Natural Area. 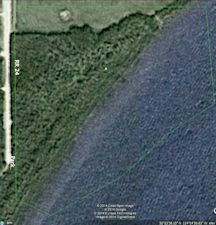 The land surrounding the Sylvan Lake Natural Area is private land and must not be entered except with permission from the owners. Click map or click here for large view. Location: From Sylvan Lake, drive north on Highway 20 to Rainy Creek Road (Township Road 400), then west to Range Road 24 and south to the gate across the road. The natural area is to the left when facing the gate. 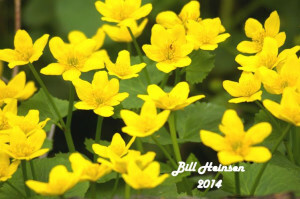 Marsh marigold (Coltha palustris) is very common. Suitability for children: 14 and over. Footwear: Rubber boots in all areas. Hazards: Fallen logs and deep water. Use care. It is not handicap accessible. Accessibility: The natural area is very difficult to walk in. 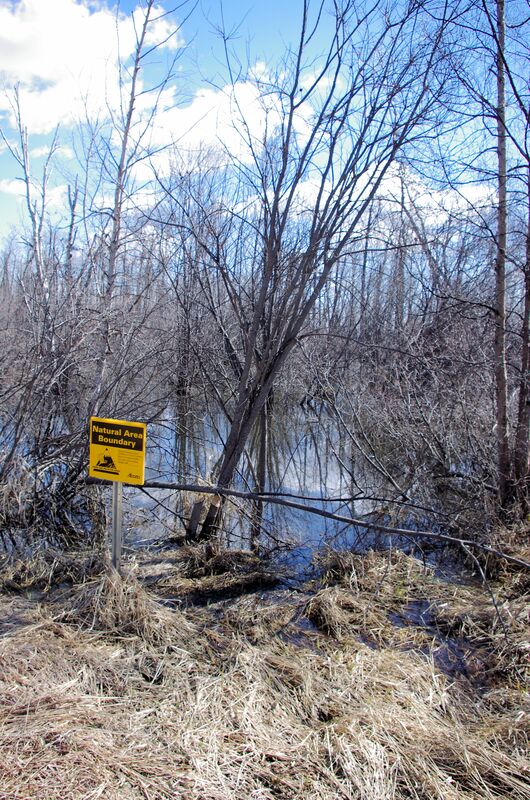 Beavers have dammed a small creek creating large ponds that flood almost all of the natural area. What used to be the entrance is now flooded. Your best bet is near the north end, but even then getting to the lake is problematic. Features: A heavily wooded area featuring plants that are hard to find elsewhere. 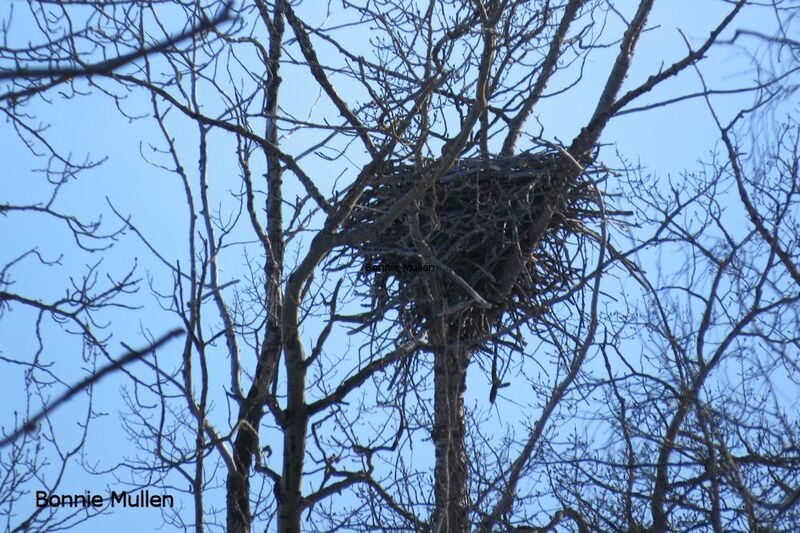 There is a fairly reliable eagle nest towards the south end; it is visible from the road. Many birds nest in the natural area and nearby. In spite of its small size, this natural area displays a tremendous variety of life. 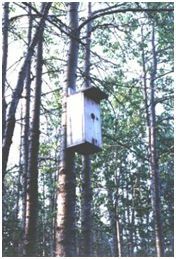 Bird boxes attract many species. Copyright 2006 W. Heinsen. The altitude of the Natural Area ranges from 936.6 metres at the lakeshore to 957 metres on the small hill. The area slopes gradually from the road towards the lakeshore. The soils are classed as grey-wooded in the uplands, organic on the shore, and transitional with deep humus layers in moist birch-balsam poplar forests. Eagles often use this nest. Copyright 2014 B. Mullin. Still, it will reward the persistent with a variety of plant species and perhaps a view of the eagle nest. The shore of the lake is boggy. Some birds can be seen. Will the cattail bed even exist in a few years? Many are concerned that allowing hundreds of homes to be built next to the natural area will increase boat traffic around this fish-spawning, and bird hatching area. The “entrance” is not really a trail. Unfortunately, this fantastic little area is under tremendous threat from developers and OHV riders. In 2004, a concerted campaign was launched by developers bent on surrounding this tiny area with hundreds of luxury homes. Although they give constant assurance that they will protect the natural area, many have doubts about their commitment. 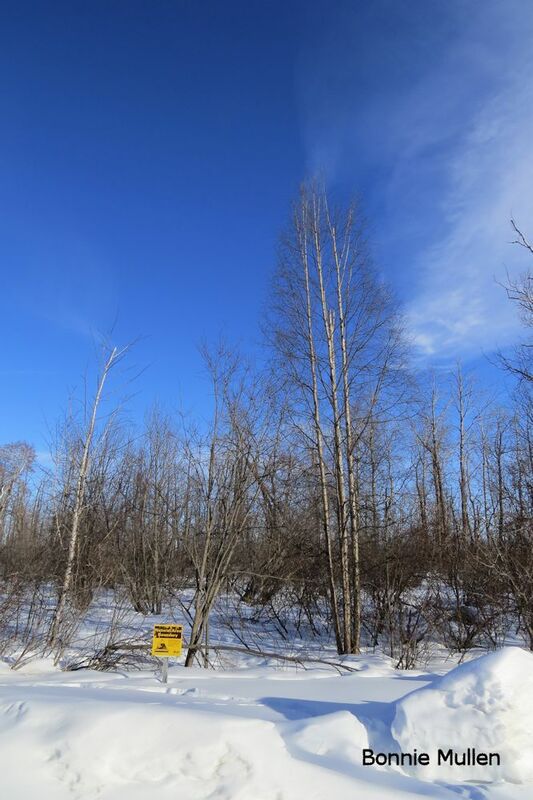 In spite of the concerns of hundreds people, the County of Lacombe has granted approval for hundreds of new houses at the doorstep of this natural area. Even now, OHV and snowmobile riders pay little regard to the signs prohibiting motorized vehicles. What will happen if the developments proceed? It is doubtful that it can withstand the pressure of use by hundreds of people. Sylvan Lake Natural Area by seasons. Sylvan Natural Area Winter. Copyright 2014 B. Mullin. Sylvan Lake Natural Area summer. Copyright 2014 W. Heinsen. Sylvan Lake Nature Area Species List.